I am the rainbow bridge to Spirit, Now. Originally from Atlantis, Maha Chohan bought to India the Sikh religion and was instrumental in creating the Golden Temple. He helped set the Sikh scripture and spread it into Sri Lanka where his retreat still resides today. Lord Maha Chohan is Cohan of the 8th Ray. He helps those on this ray to work through their deep Karmic issues, to come into true balance and to let go of negative and emotional thoughts from the mind that creates illness. He helps to avoid dark negative spaces and to keep light and uplifting colours around them. Lord Maha Chohan is very interested in working to help the planet emerge into a healthy pure environment for all humanity. He has foreseen this ever since the fall of Atlantis. He especially helps those on the 8th Ray to bridge the spirit and physical world together as one. He is a World Teacher helping cultures of people to unite in peace and harmony with divine Love. This portrait of Lord Maha Chohan is showing him in his turban of rainbow colours about uniting culture and religions to stay positive and uplifting. 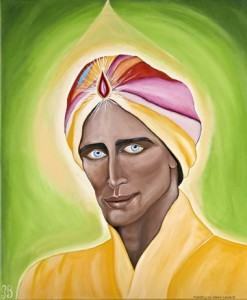 A ruby on the centre of his turban emanates light bearing to all with love from source. His aura colour is bright green bringing forth his love for our earth and planet with healing. And wearing the golden robe he was given as Master Teacher at the Golden Temple in India.